Nuisance: Becoming a delegate and surrogate candidate for Bernie Sanders: Impossible deadlines, incredible strangers, critical mistakes, and intimidation and sabotage. I applied to be a pledged delegate for Bernie Sanders on the New Jersey Democratic website. 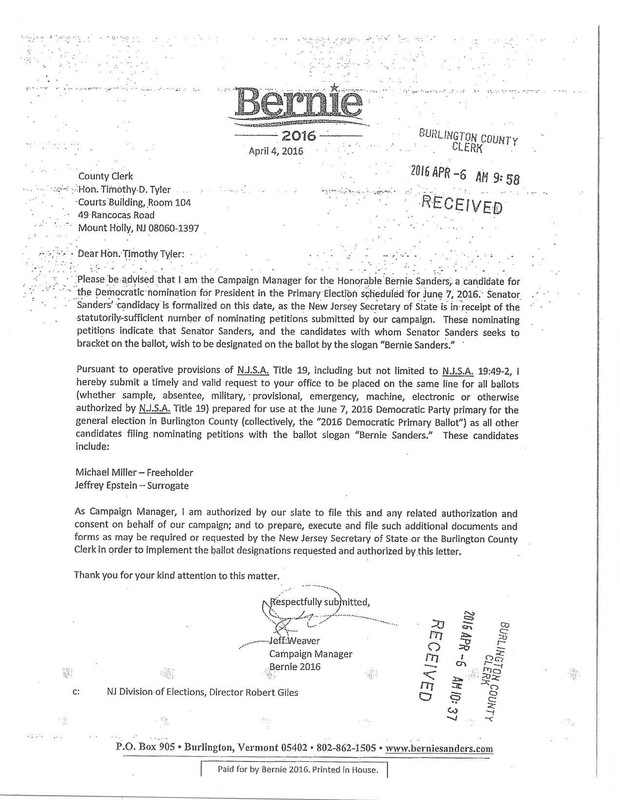 A few months later the Bernie Sanders campaign contacted me by email and said that I am among the pool of applicants that they will be choosing delegates from. I was told to go to a mandatory meeting at the campaign office in Sayerville, New Jersey. At that meeting I was given an envelope filled with petitions both to become a delegate, and for Bernie Sanders himself to get onto the ballot. I didn’t realize until later that, at this point, no one is selected “as a delegate”, rather they are selected to be a delegate candidate. After the New Jersey primary, among the pool of all candidates–and depending on the number of votes Bernie Sanders received in each delegate district–the campaign chose their delegates. I was a super-volunteer for the campaign, so I was placed higher on the list. New Jersey delegates in each “delegate district” are called a “slate”, which simply means a group of people. In my district they were five delegates and one alternate on our slate. Legislative districts are different than delegate districts are different then congressional districts. As I understand it, delegate districts are direct subsets of legislative districts, but congressional districts are only very roughly the same; there is significant overlap between them. This is almost purposefully confusing, as is much in our democracy. My delegate slate had about three weeks to collect signatures, and if I remember the numbers correctly, there were 100 signatures required for Bernie Sanders (4,000 for the entire state), and 100 signatures for our delegate slate. We collected well over 1,000 signatures for both, and–at least this was true the week before the signatures were handed in–I collected more than any other delegate candidate in the state of New Jersey, which was over a hundred people. Collecting signatures for Bernie Sanders at Wegman’s in Cherry Hill. Kicked out by hostile yet calm spoken manager Carl Curtiss, for solicitation and trespassing on private property. We didn’t approach anyone, and about 30 minutes previous, we removed all sinage immediately, as requested. His reason is that there is an announcement of the event on map.berniesanders.com, which he discovered, printed, and showed us. Mr. Curtiss threatened to call police before having a chance to gather our things. 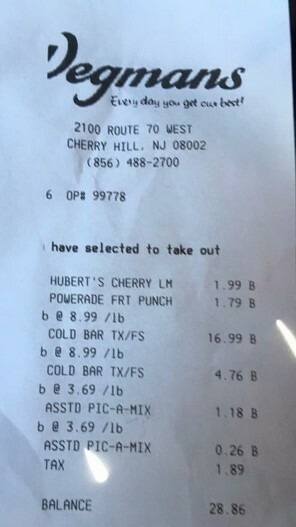 I also spent $29 on food. It is private property so they can do what they like [is that true? ], but they are selective with how they enforce their policy. There was a bible study at another table when we started, and I understand there are meetings there often. Thank goodness Kai was there. A voice of reason, having political experience with this kind of resistance. She said “The birdie has landed.” See the bird? Left to right: Atticus Garden, David Zachary, and Kevin Keefe. Becoming a surrogate, and impossible deadlines. As I arrived home from giving the completed petitions to Kristin, as I pulled into the parking spot in front of my house, I got a phone call from the Bernie Sanders campaign, asking if I wanted to run for office, as a “surrogate” with Bernie Sanders on the ballot. This would be in addition to running as a delegate, so I would be on the ballot twice. I now had to collect signatures to get myself on the ballot, with the same deadline: Monday, April 3, at 4 PM sharp. Four-and-a-half days. After learning about the surrogacy and getting my head around the reality of spending the next few months of my life running a campaign–whatever that means–I created a three hour event on Thursday, and a six hour event on Friday. Friday’s event was at The Jughandle Inn in Cinnaminson New Jersey, five minutes from my house, right near my boys’ elementary school. They were (I was!) collecting signatures for Bernie Sanders at the same restaurant the week before. They kicked me out within 30 minutes. The complaint was that I was soliciting to their customers. I wasn’t. I wasn’t walking around the restaurant asking for people to sign my petition. I was only there for those who chose to approach me, because they already knew about my event. I did initially have a sign up at my table, so people walking in would know who I was, but took it down at the suggestion of soliciting. So I went to Starbucks in Morristown. Starbucks had been friendly with us, leaving us alone because they were getting some business out of it. Someone went into the restaurant (I was sitting outside) and complained to the manager that she was insulted by my presence. I never saw the person. So I was kicked out of there as well. This was incredibly stressful, and also misled those who RSVPed to my original event. Update after speaking with an employee of the Burlington County Clerk’s office. 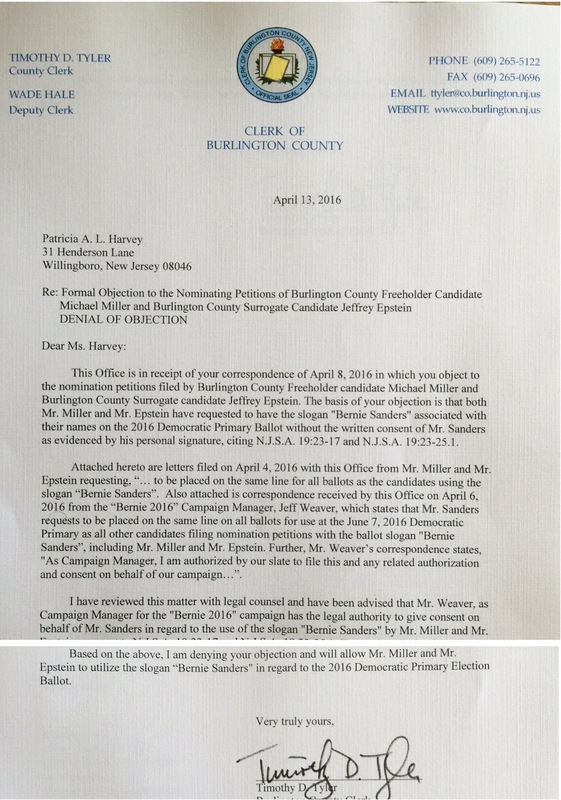 On September 9, 2016, I interviewed an employee of the Burlington County Clerk’s office. According to this person, I ended up with 193 signatures considered valid. More than I thought I handed in. It turns out that no one decided to challenge our petition, so no signatures were disqualified (“They were taken at face value”). 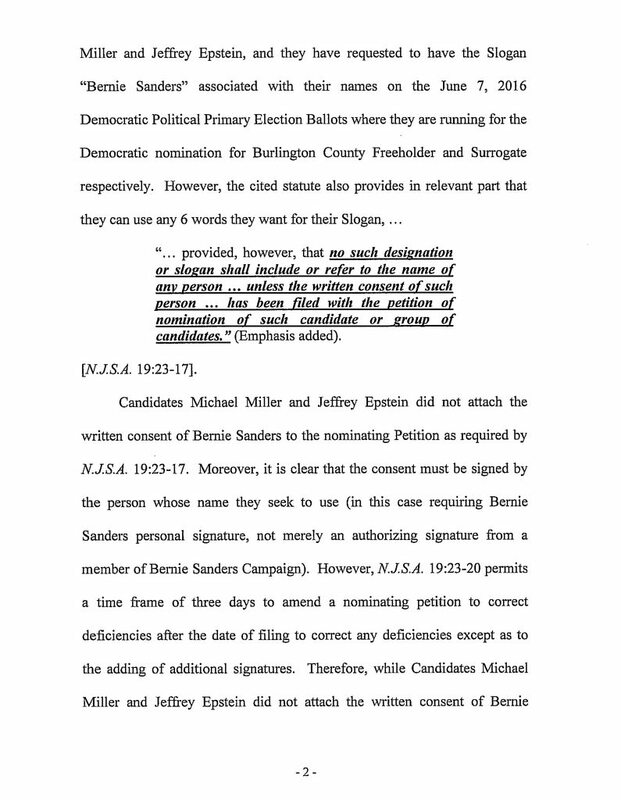 The only thing the clerk’s office itself checks for, is that signatures are not missing information, such as leaving the town name blank, and that there are no duplicate signatures. Basically, since I had so many more than required, they didn’t even bother. It turned out to be one of the craziest weekends of my life, and there is no way that I could’ve done it without the assistance of many friends and strangers, let alone those who traveled all around the largest geographic county in the state, just to sign a piece of paper. Someone I never met before called me on Saturday afternoon, and collected signatures on my behalf for 12 straight hours on Sunday. Two friends I met on my trip to South Carolina, Jessica and Cody, knocked on doors in my hometown for hours, with the support of the campaign, who gave us access to a “walk list” of Democrats in the area, using NGP-VAN’s MiniVAN phone app (the same one we used in South Carolina). Diane, a regular at my weekly phonebanking parties, organized multiple petition signing events for me. Craig, a professional photographer and videographer, followed me around for weeks, taking pictures and making videos of me, for use as however I saw fit. His picture is the one that made it into the paper. Barry Brendel from John Wisniewski’s staff was there throughout my entire campaign, with terse, blunt, and perfect support and guidance. And, finally, my new campaign partner and running mate, Mike Miller (who found out about his candidacy a couple weeks before I did), called on his friends and in some favors to help push me over the edge. On Monday afternoon, a few hours before the deadline, Mike and I met and handed in our petitions together. I reached a total of 180 signatures, and it ended up being enough. I honestly would have been only mildly surprised to not reach the official threshold of 100 “valid” signatures. One of the coolest benefits of this experience, was that, along with Mike, I was one of only around 50 candidates in the country to be personally endorsed by Bernie Sanders. Did he think I was the best person for the job? No. Did he know my name? I doubt it. But I was chosen from among the pool of super-volunteers, and it is a bragging right I will take to my grave. 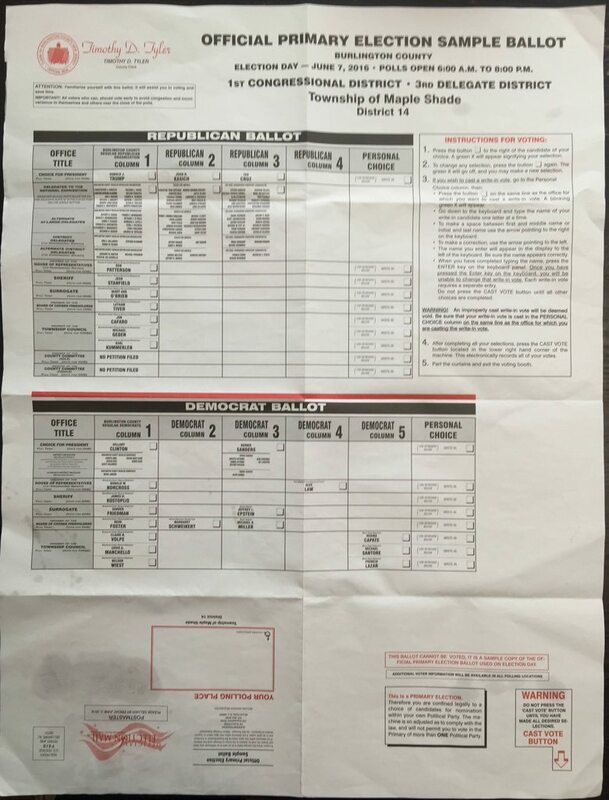 Due to the unique requirements of the state of New Jersey, in order to earn decent spot on the ballot, it is required that presidential and local candidates run together. These endorsements are what are needed for the local and presidential candidates to be “in the same bracket”, meaning column, on the ballot. gave me the envelope containing my endorsement, went to the restroom, and left. Before starting my car, I took a picture of the letter and posted it on Facebook. When I arrived home and showed the letter to my wife, she noticed that my position was listed as freeholder, but I was running for surrogate. 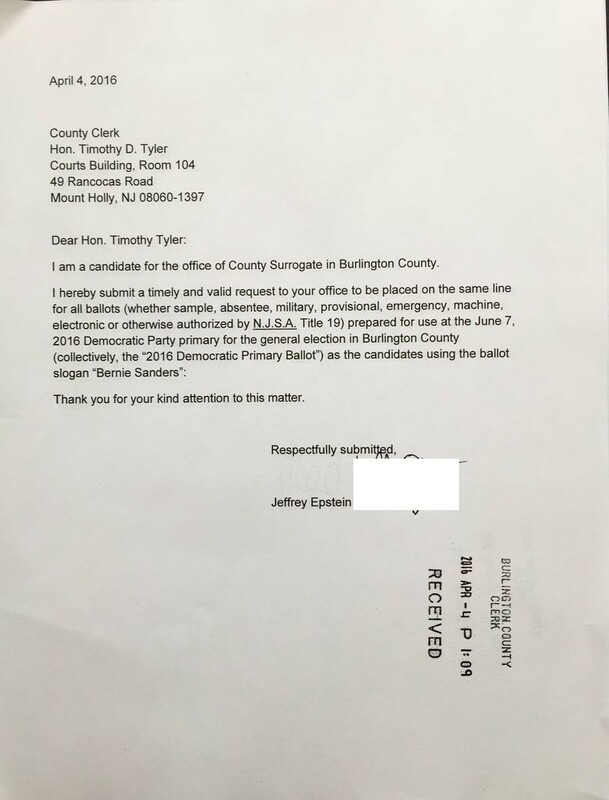 It was required to hand this endorsement letter in with my petition, and a mistake like this would likely cost both my candidacy and Bernie Sanders’ slot on the ballot. 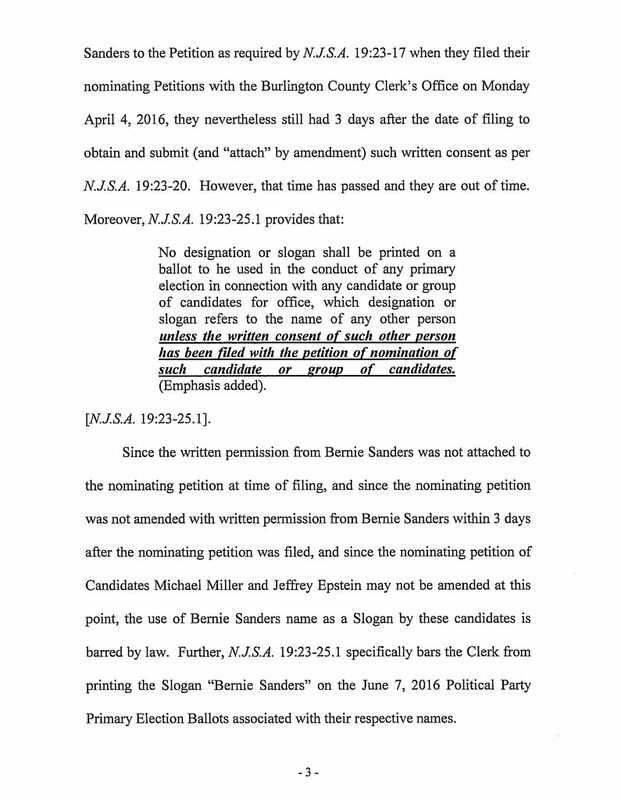 So a corrected letter needed to be written up and signed by Bernie Sanders (who I believe was campaigning in Colorado), and it needed to be delivered to the Burlington County Board of Elections by 4 PM sharp the next day. I called the campaign and was told it would be taken care of. I trusted that it was, but couldn’t truly know until later. On Friday that same week, I received a phone call from a young member of my county’s Democratic Committee. She said that there was a Committee meeting that same night, and they wanted to know if I was seriously campaigning–if I was really trying to win this position. Although she personally likes Bernie Sanders and a Bernie-supporting congressional candidate by the name of Jim Keady, the committee itself has endorsed Hillary Clinton and congressional candidate Fred LaVergne. She proceeded to tell me–repeatedly–just how much of a Bernie supporter she is, and that she also personally supports (and “just like”s) the county’s current Surrogate candidate, Sander Friedman. She expressed frustration and exasperation at the Sanders campaign, how the “situation was not properly explained” to me, and that no Berniecrat “in entire state of New Jersey” is actually trying to win. The campaign “really should have made it clear” that my only purpose is to give Bernie a decent spot on the ballot. She ended by saying that she would be happy to try and help me get some other local position in the future. This person was trying their hardest to come across as a kind and concerned person that just wanted to make me aware of the situation. I suspect it’s not completely true, but that is how I treated her and responded to her: with respect and thanks for helping me understand. My overall response was, “This is the first I’m hearing about it [which was true], and it’s a lot to think about. I need some time to get my mind around it all”. It was written the day after the intimidating phone call. Despite repeated phone calls and emails, we were never told of the details of this challenge, what we needed to do in order to respond, or even where or when the hearing was to take place. The only thing we could glean from the letter was that it implied that the endorsement letter was somehow invalid, or perhaps never even reached the Board of Elections in time? 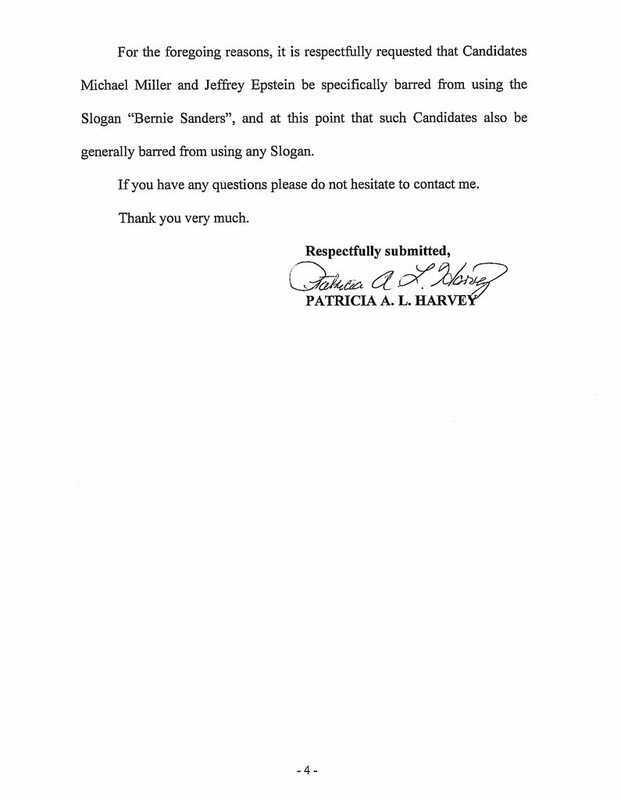 Barry confirmed that same afternoon that a corrected endorsement letter, signed this time by Jeff Weaver, was indeed received in time. According to the employee, no hearing was necessary. The Clerk’s Office consulted their lawyers in the county Solicitor’s Office (the clerks themselves are not lawyers), and immediately issued their decision. I submitted an OPRA (Open Public Records Act, New Jersey’s version of FOIA) on September 9, 2016, for the challenge itself, and will post it here if and when I receive it. “I can’t speak for every individual who has filed to run but I think that in almost every circumstance they understand that the purpose of their candidacy is not to get elected freeholder or surrogate or whatever. 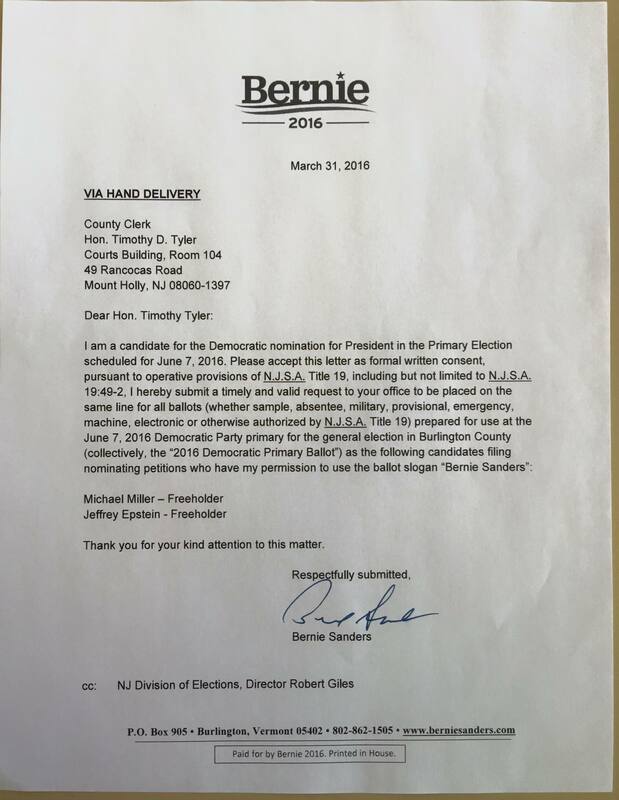 Their purpose is to provide Bernie with a favorable ballot position,” Wisniewski said. “I would venture that it is highly likely that almost all of them will spend no money, have no literature and have no campaign. Our own Bernie Sanders leader in New Jersey was strongly suggesting that I should not try to win. Assemblyman Wisniewski is clearly in a difficult position, endorsing both Bernie Sanders and establishment candidate Donald Norcross. I asked him about this during the Democratic National Convention. I don’t remember his exact response, but I left feeling listened to and less intimidated. 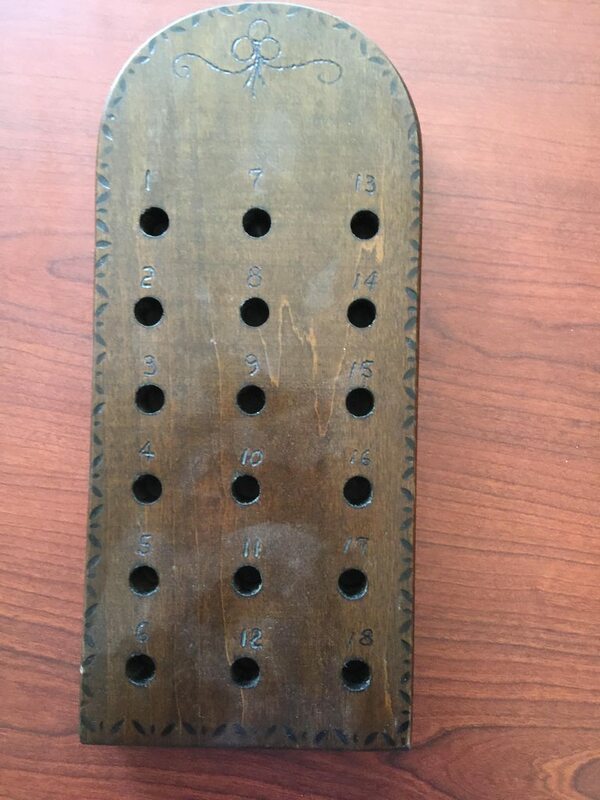 That Friday: Bernie’s spot on the ballot is decided by a bingo shaker. I return to the Board of Elections, and am guided to a small room only a few feet away from the County Clerk’s office. There are two rows of eight chairs, filled with people. I am by far the youngest. At the front is a folding table, on top of which is a bingo-like shaker. 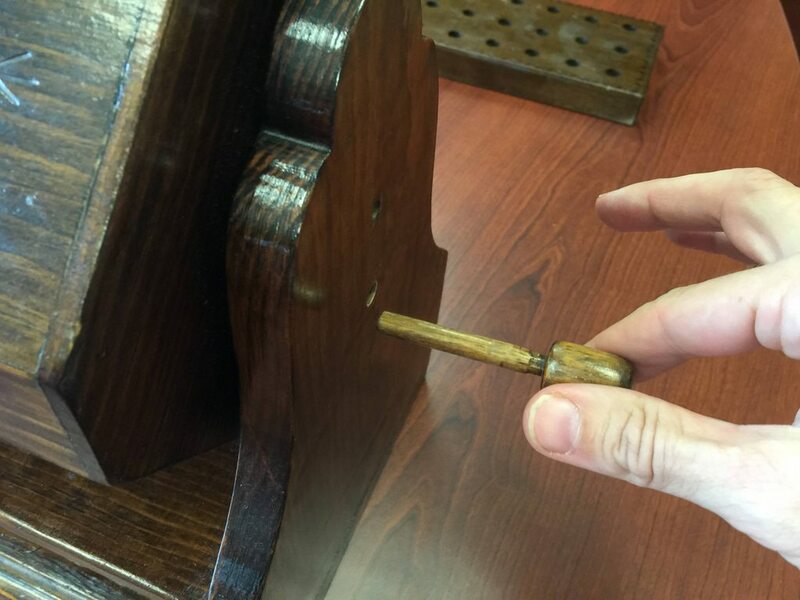 It is a wood cylinder on its side, elegantly made, which can be freely turned once the lock-peg is removed. 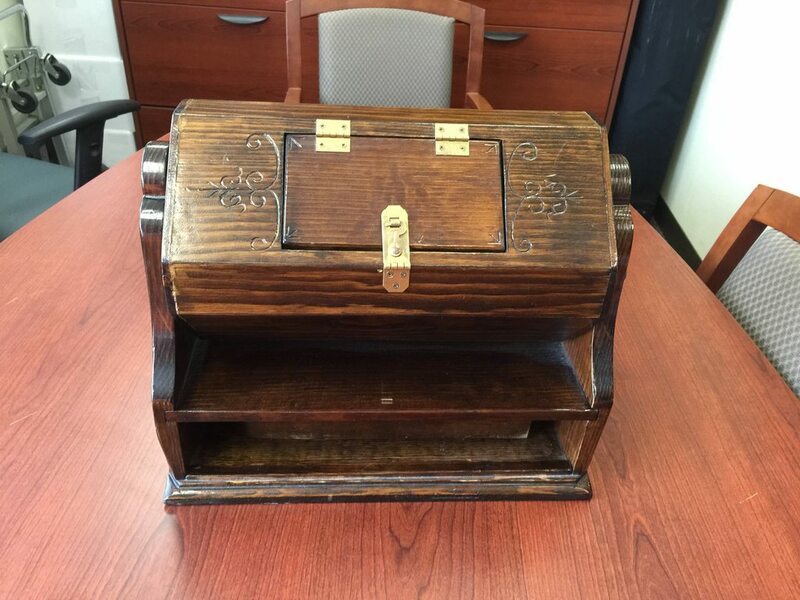 According to the Clerk’s office employee, the box was “just there when I started”, and that it was originally used as a jury selection box. This block, with numbers each having a hole below it, sits underneath the cylinder when in storage. The capsules are placed in the cylinder, the latch closed, and it is turned for a few moments. 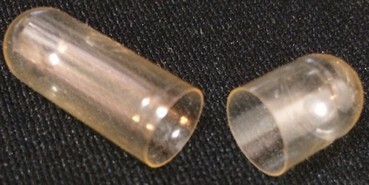 One capsule is taken out at a time. 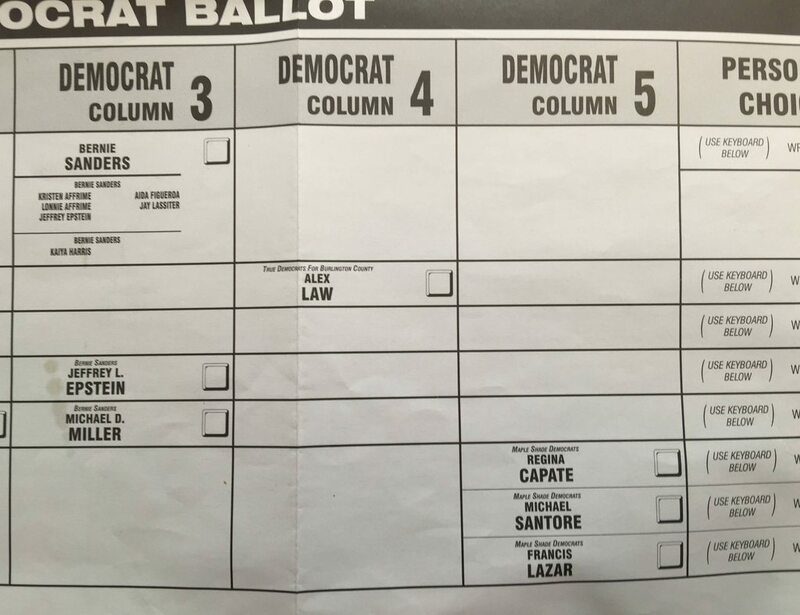 Hillary Clinton is take out first, so she gets the first (leftmost) column on the ballot, Delran is given the second, and Bernie Sanders the third. Be on time. If you are a minute late, I guarantee they’ll draw immediately. What office was drawn first for ballot position (i.e. freeholder or president)? What position were our freeholder given (i.e. Column A, Line 1)? If freeholders were drawn first, were our freeholders in the same drawing as the party organizationâ€™s freeholders (was a capsule with the names of our freeholders placed in the same box as a capsule with the names of freeholders aligned with the party/Hillary Clinton)? The only thing being decided in this meeting is the order of the columns. Within each column, it has already been decided and printed out: the president is on top, followed in order by all delegates, the alternate delegate, surrogate, and then freeholder. New Jersey statute 19:14-10 dictates where each position is listed within a ballot column. What position was Bernie Sanders given (i.e. Column A, Line 1)? If president was drawn first, was Bernie Sanders in the same drawing as Hillary (was a capsule with the name Bernie Sanders placed in the same box as a capsule with the name Hillary Clinton)? They were in the same drawing. Were our freeholders placed on the same line, column, or row as Bernie Sanders (did the county clerk ignore bracketing)? They were placed in the same line. The county did not ignore bracketing. 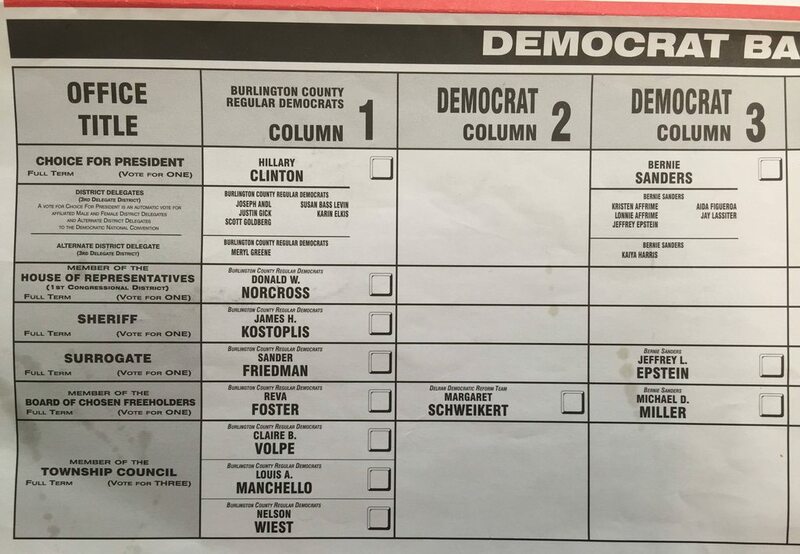 If Bernie Sanders and/or our freeholders were placed in any position other than one of the first two columns or first two rows, please notify us immediately. I did, and was told the campaign would file an appeal on Monday morning. But on primary day, on June 7, Bernie Sanders was still in the third column. Author aliteralmindPosted on July 21, 2016 June 13, 2017 Categories Bernie Sanders campaign, Jeff's DNC, Nuisance: 7/23 Pre-Sunday, Surrogate campaignTags Original content, Picture1 Comment on Nuisance: Becoming a delegate and surrogate candidate for Bernie Sanders: Impossible deadlines, incredible strangers, critical mistakes, and intimidation and sabotage. …we all know that politics aint beanbag, but John Wisniewski’s decision to bracket Bernie on the ballot with incompetent, absentee Democrats was bad for the Sanders campaign and his supporters and his delegates. The candidates he chose didn’t lift a finger to get any votes. I worked every day out of the Pemberton campaign office, for every single vote. My partner Michael Miller worked for every single vote, despite having a full-time job. And even if some did indeed choose to be a candidate in name only, labeling them as incompetent is mean spirited and unfair. Not to mention all of the supporters who helped us along the way. Real people, not the establishment. In fact, I can’t think of anything more against the spirit of this campaign, than being a Bernie Sanders delegate who bad mouths your fellow supporters. Negative campaigning is for the other guys, not us. And certainly not against ourselves! Rebuttle article from Bert, above. The article this resulted in. My name is Jeff Epstein, I’m 44 years old, and grew up in Lower Bucks County, a northeast suburb of Philadelphia. I moved to New Jersey in 2002 with my wife at the end of our honeymoon. We have two little boys, just about to turn seven and ten. I worked as a computer professional (software programming) at the Wharton School of the University of Pennsylvania, was then a stay-at-home dad with my boys until they both entered kindergarten, then worked again as a programmer at a company that made large programs for the big banks. 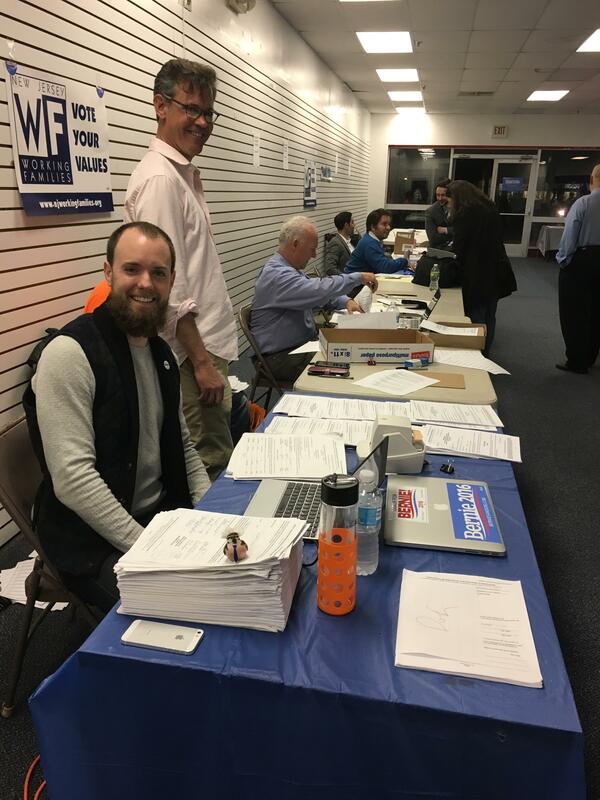 I left my most recent job three months ago and have been working full-time on the campaigns of Bernie Sanders, myself, and my incredible running partner Mike Miller, who is running for Freeholder. Do you have a family? What is your age? My wife and I met in 1987, remet and started dating in 1998, married in 2002, had two boys in 2006 and 2009. What is your career experience? How do you feel this relates well to the surrogate position? Let me be totally upfront: I am not a lawyer. I am a Masters level college graduate who reads avidly, keeps up with current events, and intimately learns whatever he sets his mind to. My Democratic opponent is an attorney with experience in probate law. I can’t pretend to match that. However, since the Surrogate does not litigate (probates of any complexity are transferred to the Superior Court), this is not necessarily a deficit. If it were required to be a lawyer in order to run for Surrogate, I would not be running for Surrogate. Do I have a lot to learn? Of course. Are there any doubts of being able to learn it quickly and effectively before January of next year? None. I am very proud of the support system that I already have gained since the beginning of this campaign. I have learned a lot, have made strong professional contacts, and will be attending significant professional training sessions, both through the state Bar and Accountancy organizations. And again, I am computer professional. I have designed and created large systems that support businesses and professionals of all kinds. I was successful because I listened to my clients needs and put myself in their shoes, in order to deliver the most effective product. The Burlington County Democrats have not done a very good job of getting Democrats elected. The entire Freeholder board, for example, is Republican. Both my and Mike Miller’s opponents have already run for these positions and lost. It is time for new blood. Mike Miller and I are passionate and enthusiastic candidates, that at the very least will provide the checks and balances that are so badly missing throughout this county’s government (both of our positions are currently being held by retiring Republicans). Even if we don’t accomplish what we propose, we will indeed provide a voice for those views, and make sure that they are heard by both those in the government, and those served by the government. To conclude: Do the people of Burlington County want someone who can “hit the ground running” but will continue the status quo? Or do they want someone that will fundamentally change the way the Office of the Surrogate works? Do you have political experience? I have been a “super volunteer” for the Bernie Sanders campaign since September . I’ve been full-time for the campaign for about three months, working in Pennsylvania, New Jersey, South Carolina, and Ohio. My campaign is based out of the Bernie Sanders campaign office in Pemberton. While I live in the population center of the county, and am only 10 minutes away from the Collingswood campaign office, I choose to travel every day, 30 minutes to Pemberton, because that is where the people are, that need the most. Why are you running for surrogate? My mom’s passing in 2008 changed me. To say that it was a stressful experience is an understatement, and that is entirely putting aside the emotional toll. The experience made me determined to create estate documents for my own family. This took many months of intense effort, but now my wife and I know exactly how my boys will be taken care of after we pass. I want to share what I have learned, to help make it easier for the citizens of Burlington county to control what happens to the people and things most important to them, after they’re gone. Can you talk a little bit about how you hope to serve the county and its residents if you become surrogate? I will be a Surrogate for ALL the people. I will provide consistent and ongoing access to my office and to myself, regardless one’s income or demographics. I will do this through community outreach, satellite offices, regular meetings and town halls with the public and with organizations, and by providing free and low-cost legal services and self-help tools. I will fight for progressive fees, so that those with largest estates pay more then those with minimal estates. There is no reason why those with small estates should pay three dollars per page for non-certified documents, as is currently the case. The Surrogate Court’s website was created by Judge Kotch’s administration, and I praise him and his staff for it. I will make one of my first priorities to form a commission to determine how this website could be improved, and implementing those changes. I will be full-time surrogate. My opponent has a full-time law practice and I am unaware of his intention to retire from it. The Surrogacy is a high-paying position that deserves someone who can dedicate 100% of their energies to it. Can you talk about why you are running on the same ticket as Bernie Sanders? Bernie Sanders has been fighting for those at the very bottom of the grassroots for 50 years. He CARES. He is the father we wish we had and the person we wish to become. But more specifically, Bernie Sanders is the only candidate that is leading a movement to get money out of politics. He is the only one truly fighting the disgusting inequality that we face in New Jersey and throughout the United States. Nothing much of consequence can be accomplished until we get money out of politics. We should not live in a two-tier government, where the wealthy have different economic and justice and environmental systems than the rest of us. But we do. I only learned about Bernie Sanders in late August. I’d never heard of him before then. He has taught me and millions of others like me, that we can actually make a difference, and if only we had known it, we could’ve been making a difference for our entire lives. More than anything else, Bernie Sanders has taught me that being a politician is not complicated. In fact, it’s simple: Tell the truth, learn the truth, and avoid anyone who tells you otherwise. I am a proud Bernie Sanders Democrat. 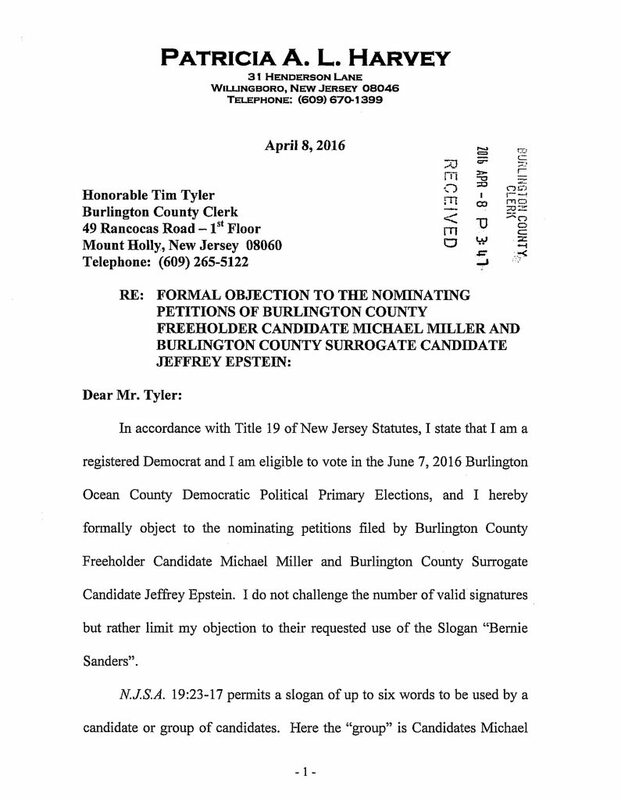 Sanders will have his own column next to Clinton thanks to Democrats Michael Miller and Jeff Epstein, who have filed to run for the Burlington County Board of Freeholders and the County Surrogate’s Office to give Sanders a column. The original link, which is behind a pay wall. Republican presidential candidate Donald Trump speaks at a news conference at the Trump National Golf Club in Jupiter, Florida, on Tuesday, March 8, 2016. 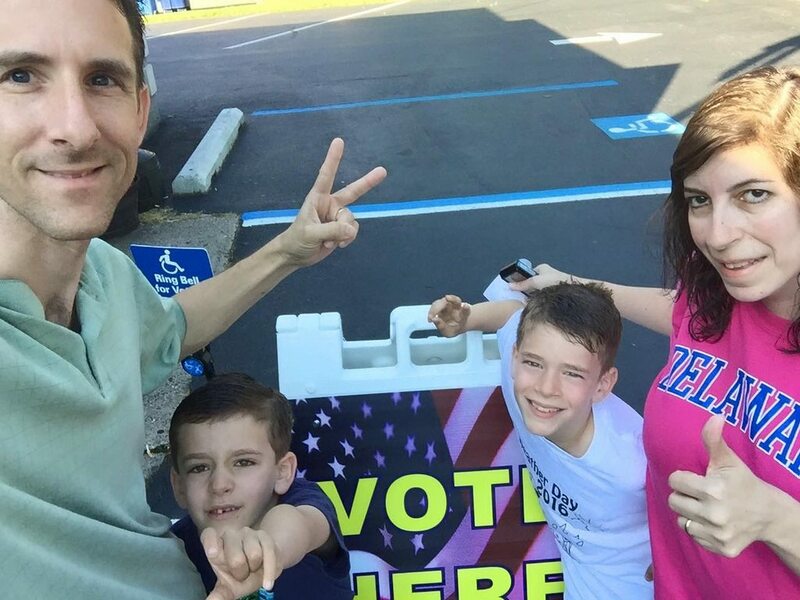 New Jersey’s typical sleepy summer primary election could get a jolt of excitement this year thanks to the presidential race and several contested congressional races at the top of the Republican and Democratic ballots. Monday was the filing deadline for the June 7 primary, and while the filings yielded few surprises — the presidential and congressional candidates have generally been known for the last several weeks — they did offer a glimpse of the contested primary matchups and also likely general election pairings down the ballot. Leading the way at the top of the ballot are the Republican and Democratic presidential races. On the Republican side, front-runner Donald Trump has a big lead in delegates over Texas Sen. Ted Cruz and Ohio Gov. John Kasich, but there’s a strong chance he may need New Jersey’s 51 Republican delegates to secure the party nomination and avoid a brokered GOP convention. Gov. Chris Christie has backed Trump in the wake of his own early exit from the presidential race, but Burlington County’s Republican Committee has not endorsed a presidential candidate, meaning Trump, Cruz and Kasich will be bracketed separately from the county party’s endorsed congressional and county candidates. On the Democratic side, former Secretary of State Hillary Clinton has a big lead over rival Bernie Sanders, but like Trump, she may also be short the required delegates entering June 7. Unlike the Republicans, the Burlington County Democratic Committee has chosen to endorse in the presidential primary race and will put Clinton at the top of the party’s column. Besides presidential contests, the most closely watched primary will likely be two Democratic congressional primaries in the 3rd and 1st districts. In the 3rd District, Fred LaVergne, of Delanco, will be running against Jim Keady, of Spring Lake, in an intercounty primary battle for the right to take on incumbent Republican Tom MacArthur, of Toms River. LaVergne will run with the advantage of having won the Burlington County Democratic Committee’s endorsement, which gives him the covered “party line” on the Democratic ballots in Burlington County. Keady won the Ocean County Democratic Committee’s endorsement. The district is made up of almost all of Burlington County and a large portion of neighboring Ocean County. MacArthur is running uncontested in the GOP primary. In the 1st District, incumbent Democrat Donald Norcross, of Camden, is being challenged by 24-year-old former IBM consultant Alex Law, of Collingswood, in a race featuring the young Sanders supporter versus the powerful former state senator-turned-congressman. The district is made up mostly of Camden and Gloucester counties, as well as Palmyra and Maple Shade in Burlington County. The winner will face Republican Bob Patterson, of Voorhees, who is running uncontested in the GOP primary. In the 2nd District, incumbent Republican Frank LoBiondo, of Ventnor, is being challenged by Edward Enes in the GOP primary. The victor will face the winner of the Democratic primary between David Cole, of Sewell, and Constantino “Tino” Rozzo, of Vineland. Besides the presidential and congressional contests, there will also be a contested primary at the county level, where Sanders supporters Miller and Epstein will take on the county Democrats’ endorsed freeholder and surrogate candidates: Reva Foster, of Willingboro, and Sander Friedman, of Medford. Democrat James Kostoplis, of Bordentown Township, will also run uncontested for county sheriff with Foster and Friedman. The Democrats’ primary winners will take on a Republican slate of Latham Tiver, Mary Ann O’Brien and Jean Stanfield. Tiver, of Southampton, is running for the freeholder seat held by Republican Joseph Donnelly, who opted not to seek re-election. O’Brien, of Medford, serves as a freeholder, but is running for the surrogate’s post in place of incumbent Republican George Kotch, who also decided not to run for a new term. Jean Stanfield is seeking her sixth term as sheriff. 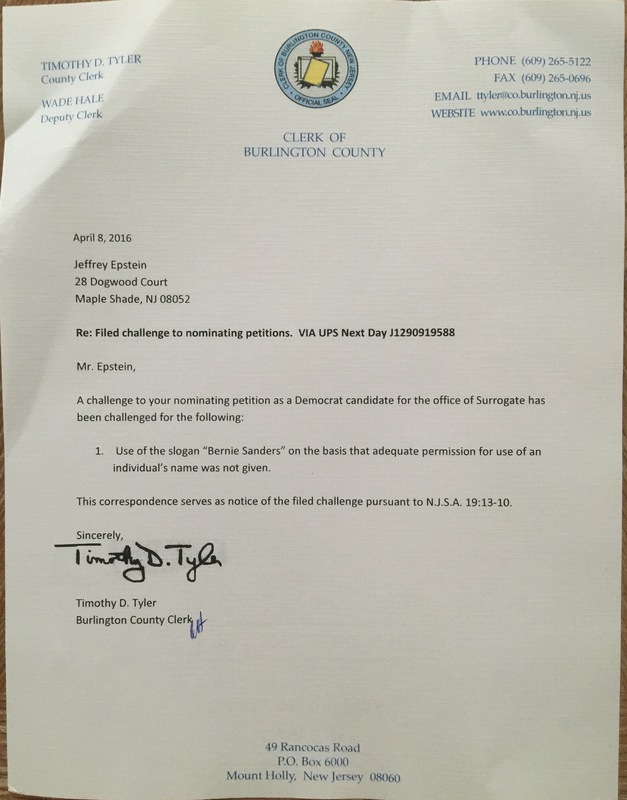 In addition to those filings, dozens of candidates filed petitions to run for local offices in Burlington County’s towns. This is part of the larger story of how I became a candidate for delegate and surrogate.